Muppathu Vellikkasu (Thirty pieces of silver) is a Christian film in malayalam which is based on the life of Jesus Christ. Considered as the biggest budget malayalam film ever made is also the first 3D film which tells the story of Jesus. Muppathu Vellikkasu is slated for a worldwide release in both 2D and 3D formats during Easter 2014. Directed by Kurian Varnasala, this film is made with a budget of Rs 35 Crores. Read more about the upcoming film Muppathu Vellikkasu. Adding more fuel for the 3D revolution in malayalam, a Christian film based on the sacrificial life of Jesus Christ is gearing up for release. The project helmed by filmmaker Kurian Varnasala titled Muppathu Vellikkasu (Thirty pieces of silver) would be a multilingual 3D stereoscopic film on the Bible, which will be released in English, 9 Indian languages including malayalam and other foreign languages. Made with a budget of 35 Crores, this would be the biggest budget malayalam film ever made is also the first 3D film which tells the story of Jesus. Muppathu Vellikkasu is slated for a worldwide release in both 2D and 3D formats during Easter 2014. The film which feature 5000 artists will have 300-strong cast will include 50 from Kerala including malayalam actors Lalu Alex, Sai Kumar. 23 year old Jermi Jairus, a native of UAE who has roots in Kerala has given life to the character of Jesus. The yesteryears' star, Raghvan will don the role of one of the twelve disciples of Christ. Even though a number of movies based on the Bible have mesmerized the audience, a 3D movie based on the New Testament would be the first of its kind. Director Kurian Varnashala who has well experience working with film personalities like Kamalahasan, K.S. 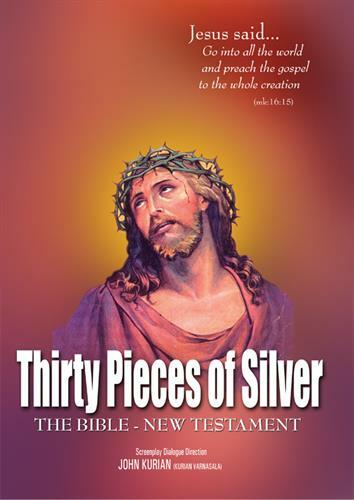 Sethumadhavan, Bharathan, Padmarajan, K.G George and A. Vincent is ready with his latest venture Muppathu Vellikkasu (Thirty pieces of silver) which narrates the eventful story of Jesus Christ in a novel way with the support of most advanced 3 dimensional technologies. The screenplay for this film was created after ten long years of Bible study supported by many Biblical scholars. To give complete perfection to the project, Kurian made discussion with many Bishops and Cardinals of Germany, Rome, Vatican and France. Ample co-operation given by popular actors and technicians from the Malayalam film industry made the project come true. In this 3 hour long movie, the history of Jesus Christ will be presented in a new way incorporating the Birth, Resurrection and Ascension of Jesus Christ. The outdoor shooting was carried out in various locations including Palestine, Egypt and Jordan while the indoor work was done at Ramoji Film City in Hyderabad while the crucifixion scenes was shot in Hampi in Karnataka. The film produced by Johny Sagarika will have a world wide release in 9 Indian languages like Tamil, Hindi, Telugu, Kannada, Bhojpuri, Marathi, Bengali, Oriya and Malayalam besides some European languages. The cinematography of the film was safe in the hands of Madhu Ambatty. For the lyrics of O.N.V.Kurup, the tunes were set by Vidyasagar. Yesudas, Chithra, Sreya Ghoshal and Vijay Yesudas have lent their voice for the songs. Around 5000 theatres throughout the world will be equipped to screen the film. The story deals with his delightful life of Jesus Christ and his disciples who spread Christianity. For the mass millions of believers, it would be a real life experience of New Testament which occurs right before their eyes. After the post-production works completed in USA and India this film will reach theatres across the world on the day of Easter 2014. So get ready for a visual treat offered by Kurian Varnasala. Pookal Paranjath malayalam movie directed by K A Nandajan is a welcome step towards people's cinema. The 2 hour long movie made with a budget of Rs 4 Lakhs is being produced by Mathur panchayat in Palakkad. Sunitha Nedungadi, Murali Mangili, Sivadasan, Sandhya Krishna and Sraddha would give life to other prominent characters. Published as a book by the students of Mathur panchayat, it got shaped into a short film; later to a feature film funded by students in the government and aided schools. John Paul Vaathil Thurakkunnu malayalam movie (film) written and directed by Chandrahasan features Deepak Parambol in lead. Influenced by a short written by Punathil Kunjabdullah, the movie is an action packed movie with suspense and thrills produced by Arjun Mohan. Sudeep Joshiy and Darshana Rajendaran would give life to other prominent characters in the movie. The movie is about some interesting incidents which happen in the life of the lead character. God's Own Country malayalam movie directed by Vasudev Sanal will have Fahadh Faasil, Srenivasan, Isha Talwar and Mythily in lead. Lena Abhilash, Nandu, Jaffer Idukki, Manikkuttan, Lakshmipriya, Vijayakumar, Sudheer Karamana and Salim Kumar would give life to other prominent characters in the movie. God's Own Country is produced by Anto Antony under the banner Anto Joseph Film Company. For the lyrics of Anu Elizabeth Jose, the music is composed by Gopi Sunder.